Royal Leamington Spa boasts Georgian and Victorian architecture, tree-lined avenues and squares, stunning parks and gardens, it offers a unique shopping, dining and cultural experience. The magnificent Royal Pump Rooms house the elegant Assembly Rooms, a traditional café and the town's art gallery and museum. 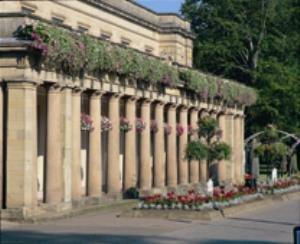 See displays on the historic use of the Pump Rooms and spa treatments. You can even sample the spa water! Opposite the Royal Pump Rooms lie the Jephson Gardens, perfect for a gentle stroll. These Grade II listed gardens of horticultural excellence have undergone a £4.3 million restoration project and include a sensory garden, temperate glasshouse, refurbished boathouse and children's play area. There is a riverside restaurant and charmingly restored Victorian tearoom. Leamington has a deservedly excellent reputation for shopping, ranging from small independently run shops to larger stores offering a wide range of products, and from boutiques selling designer labels to high street fashion favourites. The recently developed Regent Court adds to the town's excellent blend of independent and traditional shops; while the new Cultural Quarter offers dance classes and drama workshops. When the sun sets Leamington takes on a different atmosphere as bars and restaurants open up for the evening and people make their way to the theatre or Royal Spa Centre. In addition, for refreshment, Leamington has an excellent choice of places to eat and drink, from wine bars, pubs and cafés to bistros and restaurants, catering for all tastes and budgets whatever time of night or day.